My days of eating buffet food are over. Of this third point, I am absolutely certain. Let me back up just a bit here. Today was Amusement Park day. We decided this would be the best day to hit the parks because the weather forecast wasn’t that great, and we knew most of the weekend traffic wouldn’t hit the parks until tomorrow or later. With that call, we could not have been more accurate. The parks were empty, for the most part, and the kids never had to wait in line for any one ride. This is something they’ve been wanting to do since their first memories of traveling east to the beach, and they were thrilled with all they were able to do today. Two parks–one at the pier and the other at 30th street–was just about all they could handle. It certainly is nice when your kids are telling you they are done at the park! We then took a walk along the boardwalk, where we saw Randy Hofman’s sand sculptures of Christ. More on Randy below. We ended our day by driving along Coastal Highway and into Delaware to see the Fenwick Island Lighthouse. More on that as well below. We’re taking it easy tomorrow. I plan on waking at 5:20 to hit the Inlet for sunrise and see what Bellatrix and I can capture…Then it’s back home and then to the beach for the day with the family. Holland kicked off the day with a ride on the roller coaster–the one her father will never get on because, well, it goes up and down and around really fast. Braeden, happy. Now this was taken before he went on any rides–after which, he was mostly: Braeden, sad and purple. When isn’t Madelyn happy when she’s on a horse? Ok. Things got a little interesting thereafter. In the next three shots, you’ll see the before, during, and after stages of Braeden on a ride that went around and around, a little too fast. And she handled the Tornado in mid-air, mid-spin, as if she were almost bored!!! Artistry no. 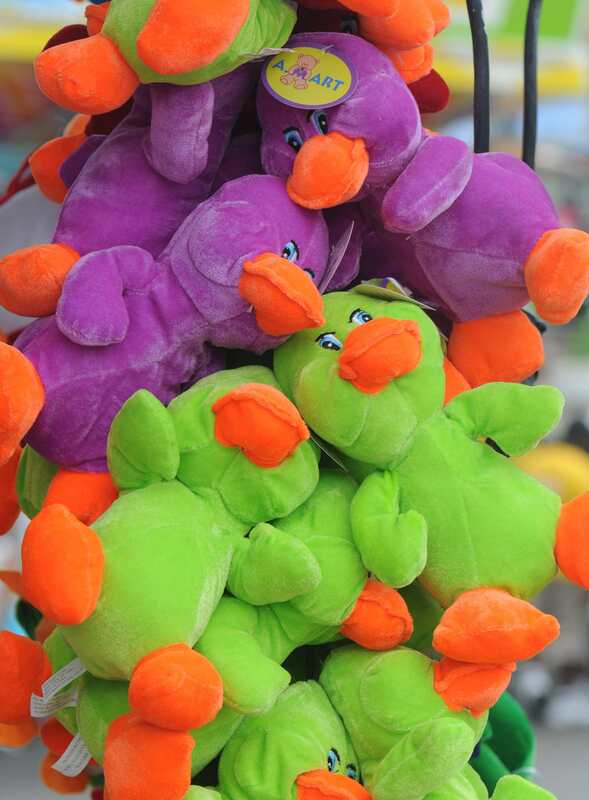 1: Colorful ducks dangling by a string…. The man waiting for his young son to finish up in the next stall smiled casually; he understood perfectly. And that’s when Braeden began sounding out the words (Here’s where I find fault with such wonderful programs like The Letter Factory). Then he noticed that the second word began with my first name. I cannot begin to tell you how much I wanted to rip that door from its hinges and read how my name could possibly be associated with That Other Word. He agreed, and when I flung the door open to his bath stall when he had finished, , I found a lifesize graffiti of text and words, telling me–SHOWING me–what the carver would like to do with an undisclosed number of Russian women. Ok. The final five. The first four are of the day’s sand castles created by Randy Hofman, who has been building such castles since 1981 on the boardwalk and 2nd street. Amazing artist. You can find out more about his mission and his artwork here. I have to tell you, that when I was shooting the FORGIVE photo, I got chills. I’ll have to explore that more later with you in another post. The fifth and final picture is of the Fenwick Lighthouse. My sister and her husband are beginning an east-coast tour of all of the lighthouses on the atlantic shores, and we visited this lighthouse while thinking/missing them greatly. I thoroughly enjoy this! Your pictures are FABULOUS! And your stories are so fun to read! You’re great! Your kids are blessed to have you for a Daddy! I remember those carvings from the last time I was in Ocean City, at least 13 or 14 years ago. It was great to see them again, even if it wasn’t in person. Thanks, Sandy and Sam…. 🙂 I am blessed to have them as our children! Sam: I remember those carvings from long, long ago….I was surprised to see that he has been doing these since 1981!